Hello again; yup it's me after another eventful North Pole-related day. Let's get the important stuff out of the way first before we turn to the subject-matter of the title. Today the Trek suddenly came one step closer to feeling real, and then another ! - Our first training weekend is confirmed; Dartmoor on 29th-31st October and by using the word 'our' it means I now know there are at least 4 others signed-up to do the Trek. The weekend was going to be in September but I and another guy are on holiday and one of the others flys out, for 3 weeks in the Himalayas - that's some serious sh*t !!!!! - The flights for the Trek itself are now confirmed as 3rd April and a return on 17th April. Evidently we have a connection and therefore an unwanted few hours stop-over in Stockholm airport when we fly out on the 3rd as they just don't have connecting flights to Barneo on the 4th April. Simon Albert (MD of charitychallenge.co.uk) cheerily typed ".... but getting a few hours sleep on a bench in Stockholm might just be the best nights' sleep you will get over the next few weeks!!!". Sobering rather than cheery would be my take on that statement. And so onto this evenings' overseas adventure; a tyre drag in a Manchester park. Well come on, for a born-and-bred Yorkshireman it can't get much more overseas than that can it! 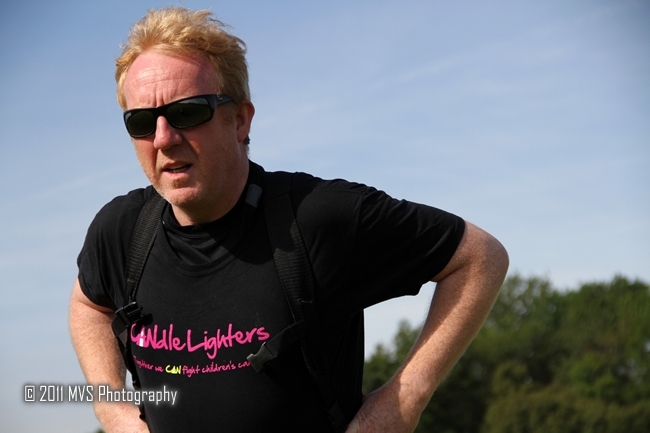 MVS Photography came to Heaton Park to take some photos as I STILL hadn't got a decent photo of me training with a Candlelighters t-shirt on and I wanted some other 'neutral' shots for press releases and letters to possible sponsors. After 10 minutes of shots Mark succumbed to the fact that being in a park with me AND the tyres means you HAVE to have a go yourself. 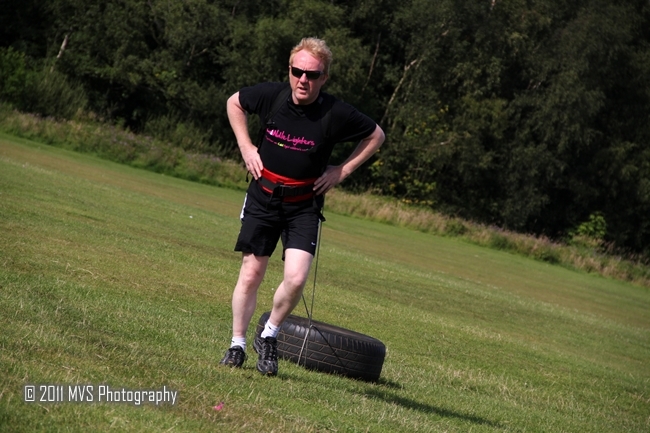 Fortunately for him I'd forgotten one of the ropes so we just had the one large tyre to drag yet, in his shirt and suit trousers, he made it look pretty easy. Once Mark had gone I set off around the Park and did (estimated) 4 miles in total, meeting some interesting people on the way including this young girl who was trying to sneak onto the tyre. I spotted her just in time before she potentially had a serious accident ......... and then gave in to my parental playful side (oh and there's no need for any comments about how white my legs seem are, especially compared to the colour of my face). And finally there was these two who were happily on the 'pop' but decided to have a go. They were very impressed about how easy I found it to pull the tyre (even though I didn't have anyone sat on it at the time ... as I said, they were on the 'pop'). Oh yes and ... err ... for those of you with good hearing, apologies for the lack of a 'bleeper' to cover-up the word used. In addition, one little girl and her Dad waved happily, one guy had a little laugh, one boy asked what I was doing and then his parents wanted to know more about why I'd decided to go to the Pole (darn good question; keep asking myself that) and after a few more stares and a remarkable discovery, I finally got back to the car. I was tired, hot but relieved because when I lifted the tyre into the boot and started to undo the knot in the rope that tied the tyre to the harness I noticed enough wear and tear on the rope that with the lightest tug, it snapped. How lucky that didn't happen at the farthest corner of the Park. What was that? Oh the discovery I mentioned above. Hmm, well I only saw one piece of dog pooh on the whole drag (well done people of Manchester and/or the Park Wardens) but I did see five (5) pooh bags dotted around the pavement. Some kind souls had apparently poop-scooped but then decided to leave the full bags on the floor. Bizarre. Right, off to plan a PR release to try and get the Manchester Evening News to run an article and use one of the MVS Photography shots, and then bed. We stock a huge selection of tyres at our Manchester and we offer tyre services manchester, tyre repairs manchester, part worn tyres in Manchester tyre manchester cheap tyres manchester, tyre services Manchester, tyre repairs manchester. We also offer free tyre balancing in our cafe.